Example shows dragging functionality across scrollable DIV containers. If DIV container is bigger then displayed size, approaching element near to the edge will start to auto-scroll. Other dragging examples are placed in Drag and Drop section. The whole magic lies in changing style position declaration. If position declaration isn’t defined then element has default static style position. So, when DIV elements is clicked with left mouse button nothing will happen until element starts to move. In that moment, script will change style position from static to fixed. This change will take out DIV element from the normal flow of the page and positioned at the desired coordinates (relative to the browser window). Element will stay at that position regardless of scrolling – and that’s desired effect. Position style has four values: static, relative, absolute, and fixed. Their explanation can be read on very good site http://www.quirksmode.org/css/position.html – it’s definitely recommended to visit. I want to use your drag and drop for generating math tests. I want to take specific asp pages which are questions and have the user drag and drop them with the snap to grid like your worksheet. Just like your example 6. Where I would have questions in “A” and drag them to a placeholder page next to it. @Tim – Preparing demo with questions will not be a problem. First step is to place a DIV drag container and include tables (needed for grid). So, if you have some basic HTML skills, this will be easy task. Next, load REDIPS.drag library, place DIV elements and dragging will start to work. Any other “page logic” can be accomplished with using of event handlers. “Shool timetable” is a good example to see how to use event handlers. Thx for that script. It works fine for me with a fix div-height. But with dynamic sizing of div/table-cells it would not use the single/switching/… dnd-restriction. In this case, it places more than one div-element in one table-cell and destroy the ordering of all other cells. I was trying to use example 14 (sorting) with FF4 and no fix div-height. @Chris – I’m preparing example16 with dynamic DIV height and I didn’t notice any problem. You can see the source on https://github.com/dbunic/REDIPS_drag … Anyway if you can send/show me the script with described bug I would be very grateful. Thanks! Thanks for scripts and those are great. I started preparing a weekly planner (7 days) based on your example03 coding. I find it’s ok with safari and FF browsers but not with IE7. Cold you suggest me a remedy. Hi, I was looking for drag and drop of rows and the tables. Is there anything that helps ? Here I want to change the order of groups and also be able to drag the participants to other groups. @Nivedita – I think that exampe19 “Groups and table rows” from redips2.tar.gz package will best suit. Please download latest package and try. Hope this is what you’re looking for. Hope you are doing great, I have a problem in IE8. Problem is that the animation speed is very slow in IE8. This is happening only in IE8, In any other browser the animation is working fine. First off, let me say this is a very useful utility you have put together, thank you for your efforts and making this available to everyone! I wanted to add my thoughts to the issue discovered by Vikas Saini. I too have encountered this issue using IE9 and have a few thoughts they may help you track down what may be the cause. When I have a table with numerous rows that existed before the the “REDIPS.drag” object is intialized, the scroll perfomance is great! However, in my scenario, I add new elements to the table using the DOM and then make a call to the “enable_drag” method after each new element is created to enable the drag behavior. When I add elements using the DOM in this manner and make the call to enable_drag() the scolling perfomance degrades quite considerably after 20 or so new elements have been added. Anyway, that is my two cents. Perhaps this additional information will allow you to recreate the behavior described Vikas and myself. Thanks again for all your efforts, great tool! @Eric – Thank you for tracking down performance issues in IE9. enable_drag() method only attaches / detaches onmousedown, ontouchstart and ondblclick events to DIV elements. Just one question, does your example contain scrollable DIV container (one or more) and does your enable_drag() call has set “init” parameter? If so, maybe the problem lays in multiple adding of event listeners to the DIV element … If you are familiar with DOM inspector you can peek to the scrollable DIV container and search for attached event listeners. Anyway, I will prepare “JS drag” example to see if this is the case. Your comment gave me the right direction where to look for the problem. All the example will dump inside (DIV) because this is the rule of jQuery. Is this the reason ? That your drag DIV can’t be recognized? @tamer Suliman – Maybe the problem is related to REDIPS.drag initialization. After example19 or example3 is loaded, drag container should be initialized to enable DIV dragging. REDIPS.drag.init() will actually attach event listeners (for onclick event) to the DIV elements. If DIV element doesn’t respond to the onclick event then init process didn’t collect all DIV elements within drag container and attach event listeners. So it works .. I can drag now the rows .. but there is other problem. But if I dragged a row inside a group to other group it didn’t dropped inside it , it become outside as if a new group instead of to be added inside ? so how i can catch the dragged div data ? @tamer Suliman – All tables should be closed within DIV id=”drag” container. You can make visible DIV container to be sure. Inside redips2.tar.gz package is source and minimized lib version. In case of debugging, use redips-drag.js instead of redips-drag-min.js so errors will be much easier to track and correct (source is well commented). The trick in example19 is to enable/disable tables depending on which row is dragged. 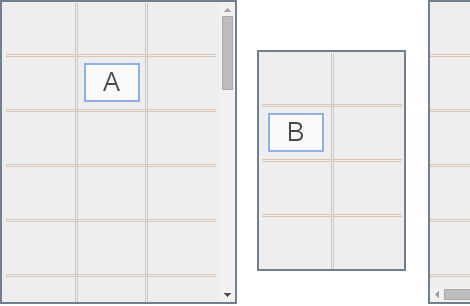 For example, if “group row” is dragged then inner tables will be disabled (like invisible for REDIPS.drag lib). On the other hand, when inner row is dragged, then “main table” will be disabled. In your case is possible that all tables are disabled and REDIPS.drag can’t drop row to any table – and that’s maybe why row is dropped somewhere outside. excuse my poor english, i’m a french!! I try to combinate horizontal scrollable DIV and cells restriction with “only”. It works for all the cells who are display at the open of the document. But if i scroll my div on the right it didn’t work. The function set_trc returns the wrong cell_current.className, it returns the className of the (hidden) cells who are on the left of the div. @GerardBaste – set_trc() method sets current table, row and cell below dragged DIV element. This is one of the core methods in REDIPS.drag library. So, if you slide scrollable DIV container to the right then error in set_trc() method will appear. If so, can you please prepare small demo in ZIP and send me attached in email? It’s important that I can repeat this error from your example (to be able to fix the problem). Thank you. and it’s OK now….but I have a new problem! When I drag a cell to another one with the “good” only the cell is highlighted, it’s OK. But when my drag cell go out of this target cell or out of the table, the cell is always highlighted. Worst, I’m out of the cell but when I released the button the drop is done. Can I change this? I’m sorry but I can’t send you any demo of my intranet application.